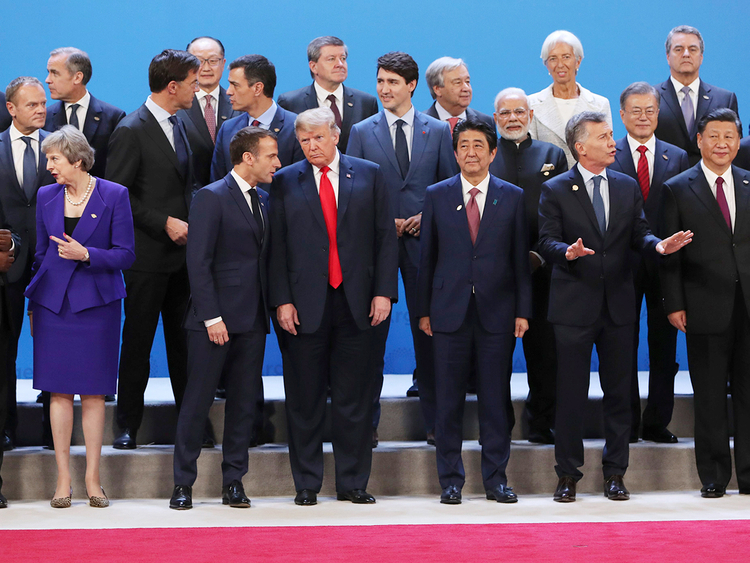 Leaders of the world’s largest economies agreed that the global system of rules which has underpinned trade for decades is flawed, in a post-summit statement on Saturday that the White House quickly claimed as a win for Donald Trump’s protectionist agenda. The Group of 20 communique was the culmination of days of round-the-clock talks. Some officials said just having a statement was a good result, given intense wrangling over issues like trade, migration and climate. Still, the watered-down language suggests further tests ahead for advocates of globalisation and institutions like the World Trade Organisation (WTO). The statement issued at the end of the two-day meeting in Buenos Aires, Argentina, omitted for the first time a reference to the risk of protectionism. While leaders recognised the benefits of multilateral trade, they said the system is “falling short of its objectives and there is room for improvement.” They committed to reform the WTO, the main global body for trade regulations, and will discuss that at their next meeting in June in Japan. A senior White House official praised the document, particularly the language calling for changes to the WTO and global trade. The addition of wording to explain Trump’s decision to exit the Paris climate accord was also welcomed by the US, the official said. While the communique said signatories to the accord reaffirmed it as irreversible, there was a separate line included underneath on the US position. The US got the better deal out of the remaining 19 delegates, according to Thomas Bernes, a distinguished fellow at Canada’s Centre for International Governance Innovation. Host Mauricio Macri from Argentina said reform of the WTO was needed for “fair trade, fair play” — language often used by Trump. Still, not everyone saw the agreement as a win for Washington, and officials from non-US countries set out to sell it after its release. “From my point of view, it’s a victory for multilateralism,” said Marcello Estevao, Brazil’s deputy finance minister. The lack of a reference to the risks of protectionism was unsurprising given many G20 members have been increasing their barriers to trade, said a senior official involved in the discussions. Negotiators from China and Europe had also pushed for language in the communique on the need for WTO reform, so it was not a victory just for the US, the official added. As often in G20 communiques, some of the globe’s most pressing issues were left out. While several leaders discussed Russian aggression against Ukraine in the Kerch Straits directly with Vladimir Putin, there was no reference to it in the statement. Nor was there mention of the concern many leaders feel about the brutal murder of journalist and critic Jamal Khashoggi in October, at the Saudi Arabian consulate in Istanbul. The document emerged after a week of difficult negotiations, providing a measure of relief to officials who feared a repeat of recent gatherings like the Asia-Pacific Economic Cooperation summit in Papua New Guinea, when no final statement was issued. The G7 summit earlier this year was upended when the US withdrew its support for the joint statement minutes after its formal publication. But the priority appeared to be on salvaging the summit itself. French President Emmanuel Macron said the absence of meetings like the G20 would spur trade wars, while Putin said the communique was useful even if it was general in nature.